Each month, HAEMR sponsors an Emergency Medicine journal club. Along with a faculty leader, PGY-2 residents rotate as the journal club facilitator. They select a topic based on their own interests, identify a contentious and hotly debated management question, or choose to review seminal articles on core content integral to the practice of evidence-based Emergency Medicine. 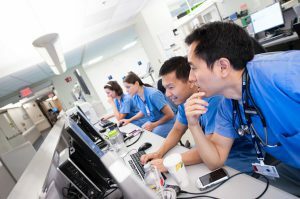 The lead residents work with faculty to identify two or three key articles for discussion, which are then reviewed and presented by a PGY-1 and PGY-3 resident. 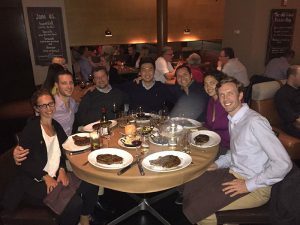 Each month, Journal Club gathers at either a local restaurant or a resident’s home to have dinner and discuss these articles. Attendance at Journal Club counts as asynchronous learning time for HAEMR conference requirements, and provides a great opportunity for residents to discuss hot topics in EM with experienced faculty in a relaxed and sociable setting. Recent topics include decision support tools, choice of RSI induction medications, sepsis scores, pediatric emergencies, and trauma protocols. Much like our faculty, the residents in HAEMR have a wide range of academic interests and passions. Based on resident input, the program created resident Interest Academies to help foster and support these interests. Every two months, we reserve time in our didactic conference schedule for residents to break out into small groups for Interest Academy presentations. While the areas of focus have changed throughout the years, currently the Interest Academies include: Leadership, International health, Education, Social EM/Health Policy, and Digital. At the beginning of each academic year, each Interest Academy provides a full one hour presentation to the entire residency to introduce themselves, their work, and highlight their plans for the year. For future meetings, the groups are encouraged to invite faculty speakers from the Harvard Community as well outside guests from across the field. While junior residents determine their own academic passions, they are encouraged to explore as many of the interest groups as they desire.